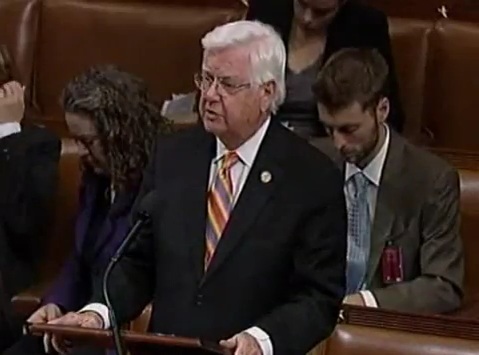 Today Congressman Harold “Hal” Rogers (KY-05) spoke on the floor of the U.S. House of Representatives in opposition to an amendment that would eliminate funding for Fossil Energy research from the FY13 Energy & Water Appropriations Bill. The Fossil Energy program is a vital part of our nation’s “all of the above” energy plan that will help drive down gas prices and home energy costs. Further, passage of the amendment would prevent investment in new clean coal technologies which are critical to Kentucky’s economy and our nation’s energy security. The amendment failed by a vote of 138-249. As Chairman of the House Appropriations Committee, Rogers has strongly advocated for such an “all of the above” energy strategy. He continues to push for thoughtful investments in emerging technologies that will allow our country to more efficiently utilize its abundant natural resources, including coal, natural gas and oil. Click on the picture to hear Rogers speak on the House floor.